Liczba stron: 179 Jest to ujednolicona liczba stron, która ułatwi Ci porównanie długości książek. Każda strona Legimi to 200 słów. Trading, in general, can be confusing. Options trading can be even more confusing. This is especially true if you don’t know what you are doing or if you have never dealt with trading in the past. Just because you’re a beginner, though, doesn’t mean that you have to stay that way. When you read this book, you will be able to learn all of the basics that you need to help make your options trading career more successful. I can’t guarantee that you will make money from options trading, but I can guarantee that this book will provide you with the tools that you need to start making money. As you are reading through the chapters, think of the different ways that each of them applies to your situation. If you have not started building capital up yet, consider how you will be able to do that. If you have not been able to find a broker, consider that. This book is full of ideas on how you can make sure that you are going to be the best options trader possible. Your portfolio will be filled with options trades that are good and profitable. You will also learn the basics that you need to know about hedges and even futures trading. Are you ready to take your beginner knowledge to the next level? Congratulations on downloading your personal copy of A Beginner’s Guide to Options Trading. Thank you for doing so. 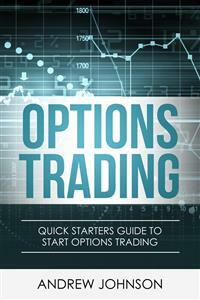 The following chapters will discuss some of the many different aspects of options trading. You will discover how important it is to make sure that you are getting a good deal on the trades that you do. The final chapter will explore how options trading can work to give you passive income. There are plenty of books on this subject on the market, thanks again for choosing this one! Every effort was made to ensure it is full of as much useful information as possible. Please enjoy! Trading is essentially the process of making money through smart decisions. You can buy and sell different pieces of companies and businesses, known as shares, through the process of trading. The beauty of this is that you are able to make money from it. When you are trading, you will first start out by making an investment. This can be a large one or a small one, but most people start with just a small one so that they are not going to be out a lot of money if they happen to make a poor choice with the investment (as beginners often do). The point of trading is to have as little risk as possible when you are trading so that you will be able to keep things as profitable as possible, or break even at the very least. After someone has initially invested in something, they will then allow it to sit for a period of time. Some people choose to just trade through the course of one day. They don’t make a lot of profit at once, but they normally have many different investments that they are working with at any time. When they do this several days a week – known as day trading – the profits typically build up. Others, though, want to let their investments sit for a week, a month, a year, or sometimes even longer. When they do this, they watch the price of the investment closely and then when it is at its highest, they sell their shares for profit. If you are planning to start trading at any point in your life, you need to know that there are differences in trading types and that you should stick to one type of trading. For example, if you have chosen options trading as your niche, you should not try to start real estate trading or investing in anything else other than what you started with. Picking a niche is the only way that you will be able to turn into a professional. You need a niche so that you can focus on one thing. When you focus on only one thing, the experience that you gain is a lot more focused, a lot more valuable, and a lot more profitable. As a result, by working with niches, you also become a better investor. Picking a niche like options trading is a great way to get started with trading and is something that most people will be able to handle when they are just getting started in their trading career. It is important to note that options trading isn’t necessarily easy. In fact, it’s not easy at all, and can be quite risky. However, it is something that you can learn in a short period of time. If you are going to start options trading, you need to learn as much as possible about it so that you will be able to be successful at it; otherwise, you run the risk of making a poor investment and losing big. That’s where this book comes in. Options trading is something that is currently very popular, and it is one of the biggest forms of financial trading in the world. Billions of dollars in contracts are traded on a yearly basis, and that is something that, obviously, has a huge effect on the economy in all areas of the world. Because of this, many believe that options trading in its current form has been around for hundreds of years, but that simply isn’t true. Options trading, as we know it today, started just about 50 years ago and has ballooned since then, becoming bigger and offering more trading opportunities for people who are thus interested. Because of the risky nature and historical tendency to lead to speculative bubbles, some investors are still leery about options trading.However, modern options trading is relatively safe.As an example of how young modern options trading is, the Chicago Board Options Exchange is one of the oldest modern options exchanges and it has only been around since the 1970s. Futures and options are really close to being the same thing. The biggest difference lies in the way that you are able to carry out the contract. For example, you are able to sell your options at any time that you want. With futures, you have to wait until the end of the contract if you want to be able to sell the investment and start to profit off of it. Futures are very limiting while options are very flexible in terms of selling for a profit. One of the biggest benefits to using options is that, as I said, you can sell them at any time that you want within a certain timeframe delineated in the contract. However, this also means that you need to make sure that you are going to truly profit from the options contracts that you have established. Because there are so many different aspects that go into trading, especially when you have somethingso functional and important as options contracts, you will be able to look at the different key points of shares and contracts,as well as the way that they are building up value while you have them. Once you’ve evaluated everything, if you want to sell your options and the price is at a good point, you can stand to make a huge profit off of them. Throughout time, people recognized that there was a need to have a way to speculate on future values. Many investors liked the way that trading worked and they especially liked the way that futures worked, but they did not want to have to wait until the end of the contract to be able to profit from the trades. This was something that they always kept in mind, but it took off when options trading became a reality. There are many ways that options trading works to help enterprising investors out, and allowing them the chance to sell their investments off at anytime that they want at a certain price point gives them the flexibility that many people hope for when they are trading and when they are doing different things. Despite the fact that options are a fairly new concept in the world of modern trading, the idea behind options trading is ancient. As far back as ancient times, people were speculating on certain markets. This was something that the modern traders to base their options trading ideologies on, and it allowed them the chance to make sure that they were truly doing things the right way by comparing their set-up to the mistakes of the past, such as the Dutch Tulip bubble. Options trading historically served the same purpose it does today: a way for people to make money off of their intuition for judging market directions. While they did not necessarily call it options trading at the time and they certainly did not have the technology that is available today, the principles behind it were the same. When futures trading first started, there were a lot of regulations for it, and people had to follow each of these regulations to make sure that they were going to be able to get the best experience possible when it came to the trading opportunities. In other words, the regulations served both the investors and the economy by preventing speculative bubbles. The same is true for options trading. However, with options trading,the regulations didn’t really start to pop up until after the concept of options trading had been long developed. Because of this, the process for developing regulations was a little different than it had been for futures, as the process for developing regulations for options trading had been based in the historical mistakes of speculative trading. Obviously, having the ability to look at past options trading scenarios was helpful when the regulations were being made. Looking to the past will invariably teach you a lot about the future. The same is true for options trading. There are a number of regulations in place based on the early mistakes of proto-modern options trading and early speculative markets. In other words, the regulations for options trading may seem rather extensive, but they are as they are for very good reason. There are a few things that you need to know before you start options trading. You need to know what options trading is, the basic language you will find in the trading world, why people choose to work with options contracts, the different orders that you can use with options trading, and the way that options work. Options are a type of trade that is in contract form. The buyer of the contract is then able to sell the asset that comes along with the contract at a specified time for a specified price. Essentially, it’s a promise from one person to another to either buy or sell something at a given price, regardless of its real market price, at a certain point. The price does fluctuate both up and down when it comes to the total value of the options, as a response to the market price and the contract price. Because of this, you can be sure that you will almost always make a profit on the options if you know the right way to buy them and know the specific terms of the contract. The biggest thing with options is that they do have an expiration date. If you do not have a chance to sell it off before that time, then you will lose your money because the contract is void. Call option – This is basically a contract in which Person A tells Person B that Person B is allowed to buy commodity/stock C at price x, regardless of market price y, as long as Person B exercises their contract by expiration date d.
Put option – The inverse of a call option; Person A tells Person B that Person B is allowed to sell commodity/stock C at price x regardless of market price y, as long as Person B exercises their contract by expiration date d.
Expiration date – the point in which the contract will expire, and it will then not be able to make any more money. If a contract holder does not sell the contract before that time, he or she will lose out on the money that was paid for the contract. Long position – The person who is buying an options contract is in the long position. They have the option, though not the obligation, to exercise the contract by a given date. Options contract – the actual contract that is purchased as an investment. It outlines the price, the value that is going to come and the expiration date of the contract at which point it becomes completely useless to the people who have the contract and who want to be able to sell it. The two biggest reasons that most people use options trading as their main form of investment are speculation and hedging. When it comes to these two particular niches, options fill them out particularly well. The speculation part is easy. Options trading allows you to essentially bet that stock/commodity c will rise to price y by date d. If you buy the stock/commodity c at price x, and it rises to price y – which just happens to be $10 more than price x – then you gain a total of $10 per share/unit in profit, if you turn around and sell the asset/commodity instantly at price y. You get the $10 in profit per share/unit because the options contract allowed you the ability to buy the stock/commodity c at price x even when the actual market price was y. So, with options trading, you can assume that an asset or commodity is going to rise in value massively for some reason or another, and then get an options contract now letting you buy it at a set price later, so that you can turn a profit simply selling the asset or commodity at market price. Hedging, on the other hand, is one of the lowest risk tactics in options trading. The people who use hedging are able to get more out of the experiences that they have because hedging provides an assurance that their money will be safe. The options that you purchase will only be available so that you can reduce the amount of loss on your investments. If you are going to hedge with options, you need to make sure that you are doing it in combination with other stocks and trading options that you have. If you have a contract that has different guarantees on it when it comes to finances, you will be able to use that contract to make sure that you are going to get more money from the various assets and commodities that you’re working with. The market price of a stock that you have may be at a certain point at any one point in time. Then, the price may go up. Depending on what the options contract was written with, the price will go up with it. The contract is usually worth 100 times the rise in the stock because it is 100 shares worth of that fund. For example, if you have an options contract that says you have 100 shares of a stock for company X, then when the price of the stock rises for company X, so does the value of your options contract. If company X goes from a value of $10 to $18, then your contract will also go up by eight points. Because you have 100 shares within that contract, it will actually be worth $800 more. When you have an options contract, you will need to create some orders that will tell your broker to do specific things. These can be things like stopping the options from losing too much money or simply limiting the amount of money that gets spent on the options. If you know which order you want to use, you will be able to make sure that you are going to truly be able to have your broker do the best work possible. Limit orders give your broker the price that you will buy or sell for. Stop limit orders will limit the way that you are able to change your money around between different options trading contracts. Market orders tell your broker to only act if the options stock is at a specific market price. Stop market orders do the same as stop loss, but they are based on the market value of the options stock. Stop loss orders are just like any other type of stop loss. You tell your broker where you want to stop losing money at.